The more we know a musician's work, the more fascinating it can be to hear them do something they don't normally do. A musician stepping outside the area they normally inhabit is a risky undertaking, and these efforts are not always crowned with success - in jazz, think of the many dreadful attempts by musicians from an earlier era to make fusion albums in the 70's in an effort to catch a zeitgeist that they had no real feeling for and probably didn't even like. Changes in musical direction are always risky, but one is usually on safer ground with changes in repertoire or changes to approach in your own repertoire. In a previous post "Miles and Trane - Two Beautiful Aberrations' I wrote about two instances in which both Miles and Trane played repertoire which they normally didn't play, both recorded in live performance situations. In these situations it's always interesting to speculate as to why they might suddenly play something different. And now I find myself speculating on another of these intriguing moments, again involving Coltrane. It's no news to anyone in the jazz world, and many outside it, that a new, never before issued studio album by Coltrane's legendary quartet has just been released. Of course I bought it immediately - the version with the alternate takes - and have been listening to it a lot. Apart from hearing a new Trane original, which is fascinating in itself, the track that stood out for me is 'One Up, One Down'. And the reason it stood out for me is because it is arguably the only time, at least with the quartet, that Coltrane did what can clearly be seen to be an arrangement in the traditional sense. 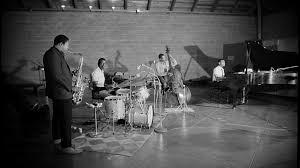 Now of course Coltrane did arrange his pieces, with intros, altered changes (in the case of standards), and occasionally bass lines etc.. And he did create larger structures such as 'A Love Supreme', but in general his music with the quartet was largely developed through the improvising. In general the melody is played and then the quartet improvises. It could be argued that an earlier album, "Africa Brass", is also arranged, but it is a large group and the arrangements were apparently done by Eric Dolphy. With ''One Up, One Down', we are listening to a very unusual piece in the Coltrane recorded canon, a piece in which what will happen, and what order these things will happen, has clearly been decided by Coltrane in advance. The first thing to notice on this track is that there are drum breaks. This is very unusual in the quartet's recorded output, in fact I thought it might have been unique, but the great drummer and true jazz scholar Eric Ineke pointed out to me that this was done on 'Blues to You' on Coltrane Plays the Blues, recorded three years previously. The second thing you notice is that rather than the breaks occurring at the end of the piece in the traditional way, they occur throughout the tune. And when you listen to how this works, you can quickly hear the arranging logic in how it's done. I find it fascinating to speculate on the way the number of shout/break chorusses diminishes as the piece goes on. Was this accidental or deliberate? 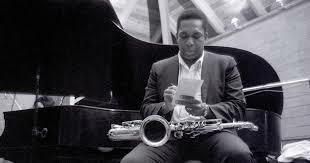 A function of improvising, i.e just the way it happened on the day, or part of a predetermined plan on Coltrane's part? Knowing what we know now about Trane's meticulousness and interest in numbers and structures, I would be very surprised if the reduction in the number of cycles was not predetermined. But if it was a deliberate plan, then what was the underlying reason for it? Fascinating to speculate. Another speculation of course, is why did Trane decide to do this quite elaborate arrangement, and why only this one time? A further speculation, where did he get the drum break interlude idea from? Here's some speculation on my part - from an album released in 1962 under Elvin's name called 'Elvin!' This is one of the few albums with the three Jones brothers on it, and Thad's arranging fingerprints are all over it. Thad is of course known for his big band writing, but I love small group recordings under his name or in which he has a hand in arranging, they demonstrate that brilliant arranging can enliven recordings of any band, regardless of size. And here is 'One Up, One Down'. The arrangement really works and creates a concise piece with a powerful forward motion. And of course the playing.... Elvin is just incredible on this - the power, the fearlessness, the swing! I wish Trane had tried this experiment a few more times, but I feel lucky to have had the chance to hear it at all.